Magic, sorcery and witchcraft are among the most common themes of the great medieval Icelandic sagas and poems, the problematic yet vital sources that provide our primary textual evidence for the Viking Age that they claim to describe. Yet despite the consistency of this picture, surprisingly little archaeological or historical research has been done to explore what this may really have meant to the men and women of the time. This book examines the evidence for Old Norse sorcery, looking at its meaning and function, practice and practitioners, and the complicated constructions of gender and sexual identity with which these were underpinned. Combining strong elements of eroticism and aggression, sorcery appears as a fundamental domain of women's power, linking them with the gods, the dead and the future. Their battle spells and combat rituals complement the men's physical acts of fighting, in a supernatural empowerment of the Viking way of life. What emerges is a fundamentally new image of the world in which the Vikings understood themselves to move, in which magic and its implications permeated every aspect of a society permanently geared for war. In this fully-revised and expanded second edition, Neil Price takes us with him on a tour through the sights and sounds of this undiscovered country, meeting its human and otherworldly inhabitants, including the Sámi with whom the Norse partly shared this mental landscape. On the way we explore Viking notions of the mind and soul, the fluidity of the boundaries that they drew between humans and animals, and the immense variety of their spiritual beliefs. We find magic in the Vikings' bedrooms and on their battlefields, and we meet the sorcerers themselves through their remarkable burials and the tools of their trade. Combining archaeology, history and literary scholarship with extensive studies of Germanic and circumpolar religion, this multi-award-winning book shows us the Vikings as we have never seen them before. The Other and the Odd? 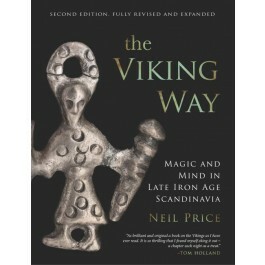 An archaeology of the Viking mind?